Styling our kitchen is probably my favorite thing to do in the history of home decorating. I love rearranging shelves, clustering things on the countertops, even making the inside of the cabinets look pretty. When I asked you all at the end of 2018 what you wanted to see more of on the blog this year, this was one of the most common requests, so I thought I would put together a bunch of the rules I like to follow, ways I like to add character & some of my favorite things to use in styling! Buckle up, it’s a long one. Ditch Countertop Appliances // First things first, I love having practical things out on display but I secretly hate countertop appliances. Toaster ovens, blenders, waffle makers, all the things, unless used daily, can typically live in cupboards or drawers. Our coffee pot lives in our office (although I do love a good coffee station in the kitchen), our microwave in the pantry and even our toaster in our last house was kept in a big drawer because we didn’t have a lot of counter space. Have a cupboard full of bowls, cakestands or serving platters? Let’s use those for styling & use that space for your juicer (again, unless you use it daily) instead. You would be surprised how much room you have for decorating when your countertops aren’t taken over by microwaves & instapots. 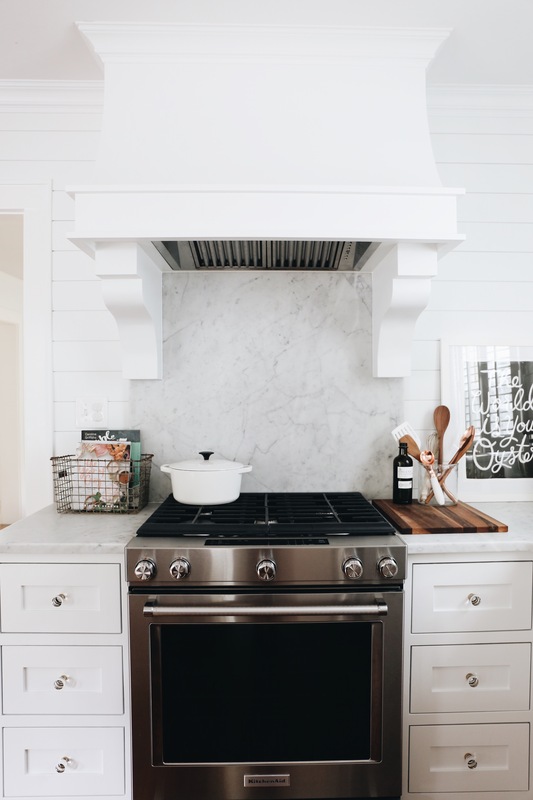 Declutter // Bills, keys, childrens artwork, all of those things can also totally distract from a beautifully styled kitchen. 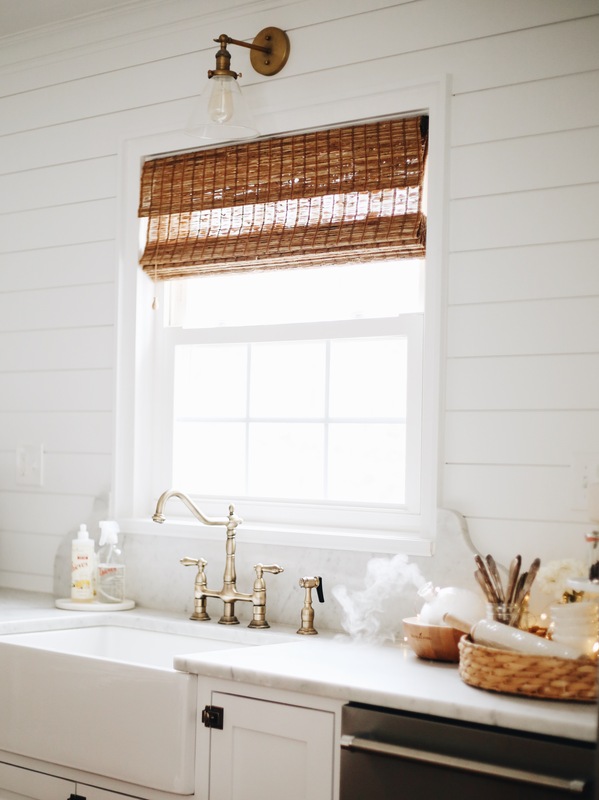 Give all of these things a designated place, maybe the top drawer of a dresser or console table in another room, a designated kitchen drawer, an office or entryway space, just somewhere other than your kitchen counter. A cluttered kitchen counter is bound to just drive you nuts and can get out of control very quickly. We have one drawer in our kitchen that we use as a junk drawer & another that we put all of the kids artwork in (and then once a year or so we take out what we are keeping and move to a designated rubbermaid tub upstairs in our closet). Our keys & such go in a drawer in our office and bills go on our desk. Art // I think for the most part people forget that they can hang art in a kitchen. We think of it as a workspace rather than a room to decorate, but art makes a huge statement in the kitchen. If you have open shelves, opt for some smaller pieces that you can prop up. Art can go on countertops, behind the range (although you would want to clean it often), or any open wall space that you might have. I love florals or hand lettered artwork in the kitchen for something unexpected. Baskets & Trays // Ok this is the fun part. All of the stuff you have left out on the counter that you love & use should be clustered together into baskets or trays. It’s okay to have lots of these! I have a wire basket of cookbooks, a cutting board with my cooking oils & utensils, another wooden tray with some pretty kitchen accessories and then a large round basket full of, well, more pretty kitchen accessories. Think bowls, cake stands, rolling pins, measuring cups/spoons, candles (we don’t burn candles often but I still love the look of them! ), linen napkins, really just anything that (dare I say) sparks joy! 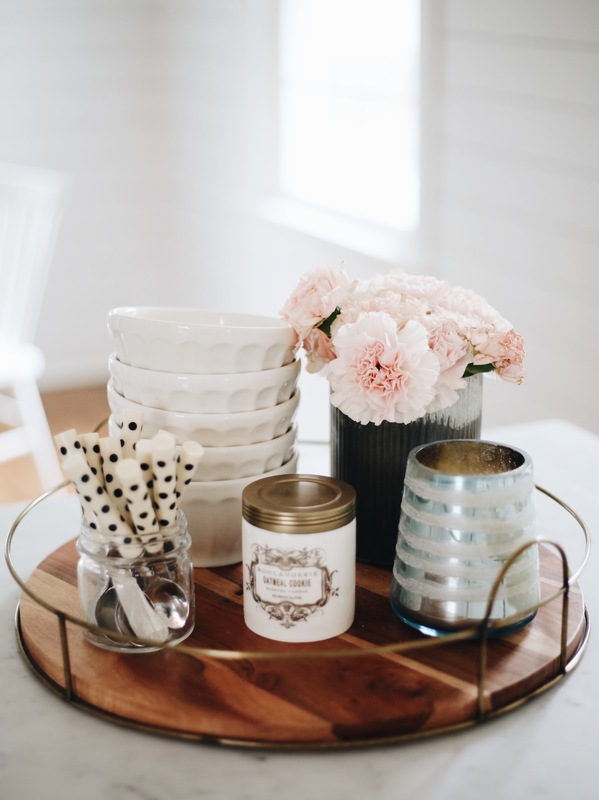 Anywhere you have lots of items, find a way to group them, even things like dish soap and hand soap will look cuter if you put them on a small tray or dish! I’m obsessed with these right now for containing all the clutter, my mom has one by her kitchen sink with soap, cleaner & sponges and I have one in my office for my pencils, glasses & other accessories. 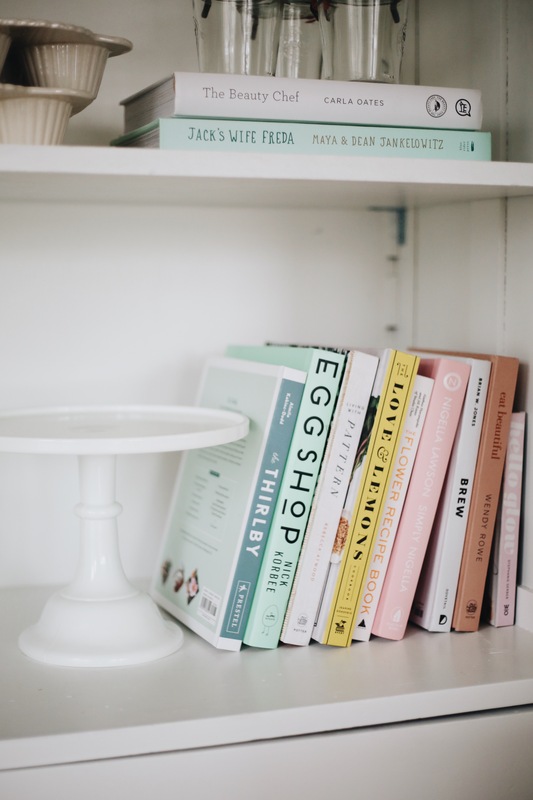 Cookbooks, Cutting Boards & Canisters // These are three of my favorite items to use in kitchen styling. I love lots & lots of books, look for ones that you will not only use but also have pretty book bindings. You can find a list of my favorites here! I keep a bunch on my open shelves, inside my glass cabinet in the dining room & also in a wire basket on my counter. 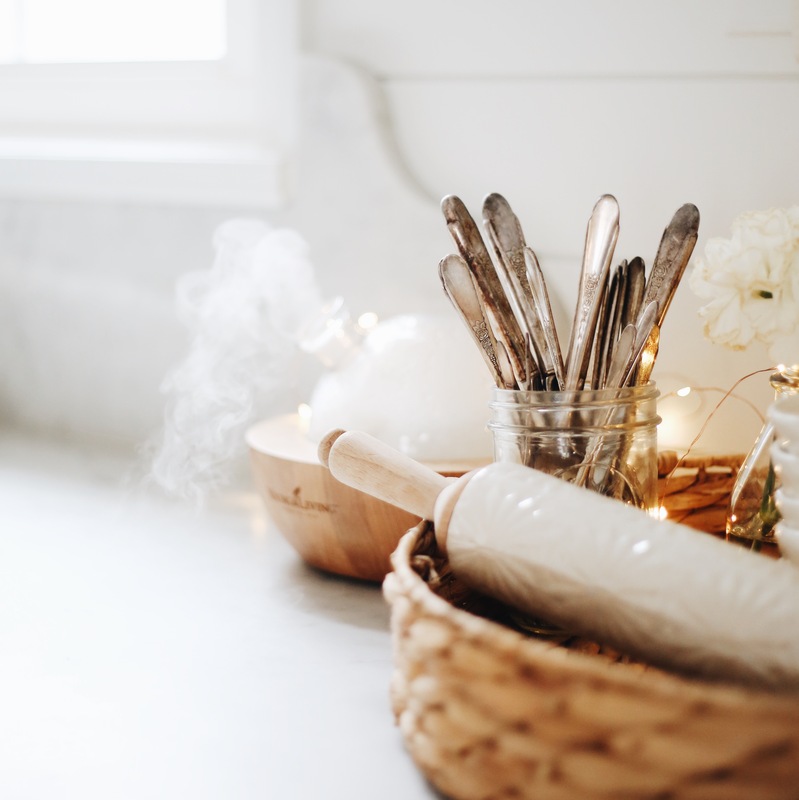 Storing food in glass canisters on the countertops is also a great way to accessorize, flour, sugar, oats, cereal, even animal crackers all bring texture while still being functional! I’m also a firm believer that one can never have too many wooden cutting boards, they can be propped up against the back splash, used to set oils and other cooking items on and then used for serving or charcuterie boards! Fresh Flowers + Plants // Flowers and plants will bring your kitchen to life!! I love a fresh rosemary plant or something that I can actually use for cooking, but also I am never good at keeping things alive. So! Fresh flowers it is!! If you have a Whole Foods or Trader Joes nearby, you an likely get flowers for under $5 each week!! #worthit. Also, think outside the box (or should I say outside the vase) for what to keep them in. I like milk glasses, baskets or mason jars. I know this was a ton of info, and obviously all of this is just my opinion and ways that I enjoy styling our kitchen, but I hope you found something helpful in here!! If you need a place to start, just dig through your cabinets and drawers, pull out all the things you love & go from there!! Happy kitchen styling, friends!! 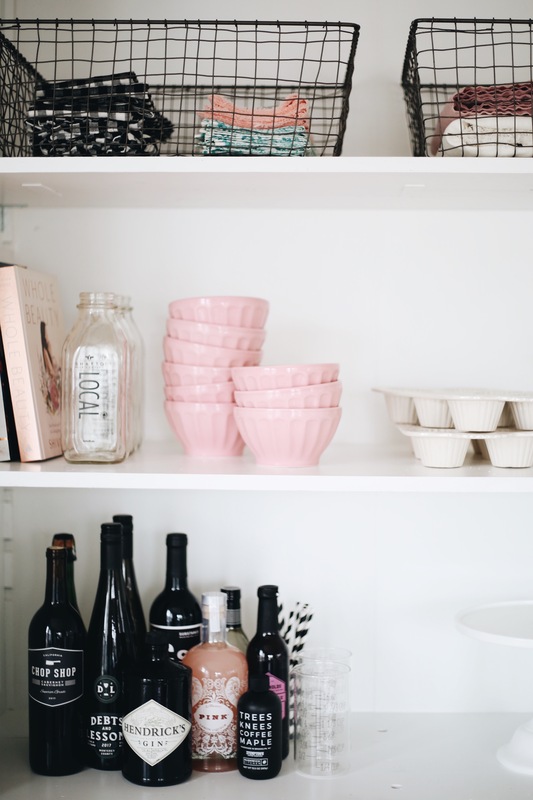 Scroll to the right to shop this post + a handful of my favorite kitchen items!